KUCHING: With 45 years of experience, the Sarawak Economic Development Corporation (SEDC) is the main player to build the proposed light rail transit (LRT) system in the state. 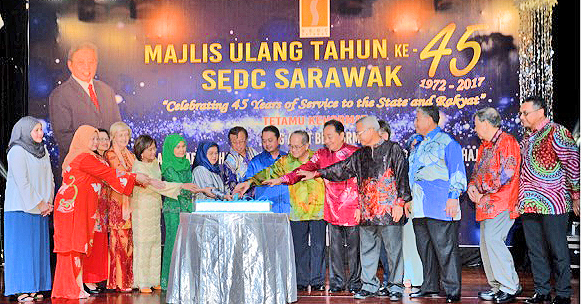 This was revealed by Chief Minister Datuk Amar Abang Haji Johari Tun Abang Haji Openg during the celebration dinner of SEDC’s 45th anniversary at Riverside Majestic Hotel here on Tuesday. “I know that some say I am too ambitious or that I think too big, but if I want something done then I will get it done. “Mark my words, within these three years, construction will have to start. “It may be completed well beyond 2020, but at least we’ll have something by then such as a main line,” he said. Johari, who is also the Minister of Urban Development and Natural Resources, said that the LRT will be from Serian to Damai and will benefit not only locals, but tourists as well. “It will also expand business and create new townships,” he said in his speech. Also the Minister of Finance and Economic Planning, Johari said that together with the approval of the Prime Minister and Bank Negara, the state will have its own Development Bank of Sarawak (DBOS). “This will help to finance strategic projects which will act as a catalyst to a modern economy and make Sarawak the forefront state in Malaysia,” he said. Meanwhile, Johari also congratulated SEDC on their 45th anniversary and for the role they played in changing the economic landscape of the state. “This has given opportunities for the people to venture into entrepreneurship and the industry. “With that being said, I am confident that SEDC can make the leap forward to the current economy landscape, which is a digital economy. “Technology changes very fast and unless we are at par with it, we will be left behind,” he said. Among those present that night also included Deputy Chief Minister Datuk Amar Douglas Uggah and State Secretary Tan Sri Datuk Amar Mohamad Morshidi Abdul Ghani. 45-year-old SEDC best to build proposed LRT 0 out of 5 based on 0 ratings. 0 user reviews.